Trusted by organizations, government, business and individuals worldwide. 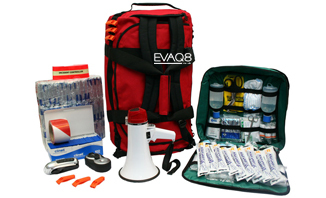 Applications include first aid, emergency planning and preparedness, mass events, outdoor, sports, beauty, sensory, health ... They are stocked in case of evacuation for example at sport centres, hotels, schools and many other public and private sites. 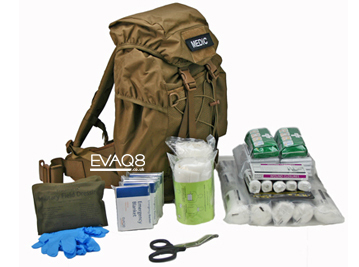 Typically used by first aiders in the treatment or prevention of shock and hypothermia. 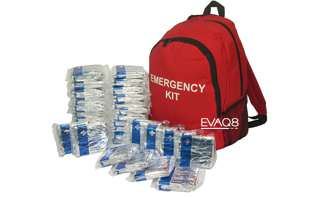 A red 'Emergency Kit' backpack containing 50 adult-size foil blankets. 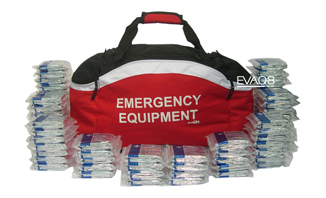 Strategically located, these bags can be grabbed at a moments notice in response to emergency planning procedures. Organizations also have a duty of care to visitors, so include them when estimating potential users. Standard emergency Equipment holdall stocked with 200 foil blankets. Efective and legant storage and transportation solution for emergency foil blankets. 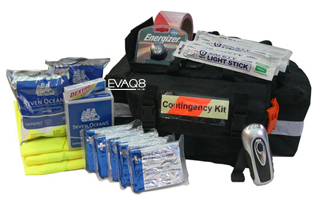 EVAQ8 produce emergency kits that you can depend on in any emergency or disaster, equally effective in the event of a rapid evacuation or a shelter-in-place situation. 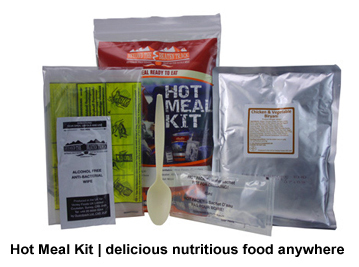 Foilblanket.net is a microsite owned by EVAQ8 to raise awareness and showcase Emergency Foil Blankets as a const-effective solution for first aid and shelter. 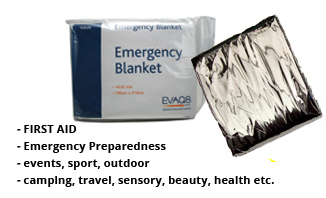 Foil Blankets have a wide range of applications which includes survival, emergency and disaster management and preparedness, first aid, sports, beauty, health and wellness. Foil blankets are commonly included in standard and custom-made first aid kits, emergency kits and safety kits. Visit our website for more information.